Earlier this year, a very Pokémon-esque octopus was discovered in deep waters off the coast of Hawaii. Researchers are learning more about this previously unknown species, and how its fragile reproductive cycle could be threatened by deep-sea mining ventures. 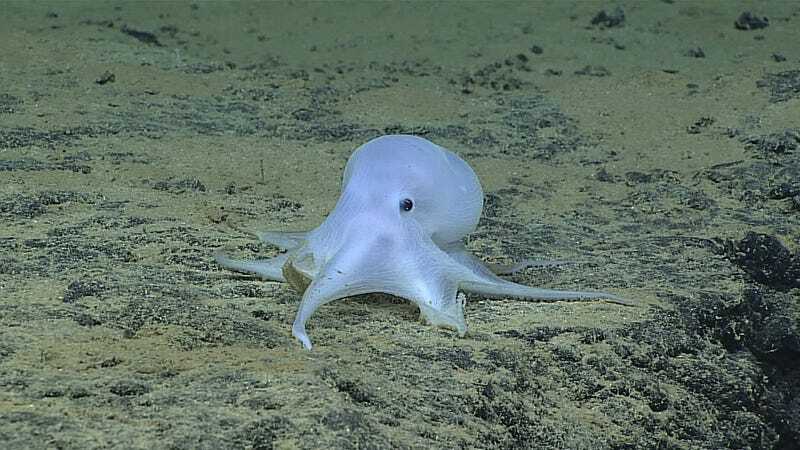 Dubbed “Casper” for its ghostlike appearance, this colorless and nearly translucent species of incirrate octopus (i.e. octopods without fins) was found at a record depth of 2.5 miles (4 km) off Necker Island near Hawaii. In a new report published in Current Biology, a research team led by Autun Purser of the Helmholtz Centre for Polar and Marine Research describes how deep sea octopods like Casper lay their eggs on the dead stalks of sponges attached to the seafloor. Regrettably, these stalks are rich in manganese, as well as other increasingly valuable metals used in cell phones and computers. Very little is known about deep-sea incirrate octopods, but they are known to protect and brood their eggs until the juveniles hatch. To learn more about these creatures and their strange breeding habits, the researchers studied nearly 30 individuals using a remotely operated vehicle between 2011 and 2016 off the coasts of Hawaii and Peru. Observations revealed that female octopods likely brood their eggs until they hatch, a process that could take years given how cold it is down there on the seafloor (talk about commitment!). The sponges on which these eggs are laid only grow in areas where there are small, hard nodules or rocky crusts. These outcrops are of interest to mining companies because of the metals they contain, including manganese, copper and nickel. Deep-sea manganese nodules form similarly to pearls in an oyster, and in a process that takes millions of years. Metals gradually build up in rocky layers onto a small starting seed, such as a shell fragment or even a shark’s tooth. The potato-like nodules contain rings of metal-rich layers, including rare earths—high-tech metals used in the production of cell phones and computers. Most of the land-based sources of rare earth metals have already been discovered, and demand for them is only growing. Discouragingly, the researchers found that incirrate octopods are abundant in areas where manganese crusts can be found—areas in which deep-sea miners are hoping to extract these metals. “The brooding behavior of the octopods we observed suggests that [the octopods] may...be susceptible to habitat loss following the removal of nodule fields and crusts by commercial exploitation,” conclude the researchers in their study. Making matters worse, these octopods are long-lived, which means recovery could take a while, and may not even be possible with all the hard seafloor suddenly gone. The loss of one of the deep sea’s largest creatures would be a blow to these delicate ecosystems. “Octopods are sizable creatures, which eat a lot of other smaller creatures, so if the octopods are removed, the other populations will change in difficult to predict ways,” noted Purser in a press release. Looking ahead, the researchers will continue to study the nodules in order to evaluate their importance to microbes and animals, such as starfish, crabs, and fish.